The American band Maroon 5 released their debut album Songs About Jane in 2002, and chart success has followed them ever since. Who are Maroon 5, how old is each member, when are their birthdays, how tall are they and where are they from? Maroon 5 are a pop-rock band originating from Los Angeles, California. The band has seven members. The lead singer of the band is Adam Levine, 40, who was born on March 18, 1979 in LA. He’s 1.82 metres tall. Jesse Carmichael, the band’s rhythm guitarist and keyboard player, is 40. He was born on April 2, 1979, in Boulder, Colorado. He’s 1.82 metres tall. Mickey Madden plays bass and is 39. He was born in Austin, Texas on May 13, 1979 and stands at 1.74 metres tall. James Valentine from Lincoln, Nebraska is 39 years old. He was born October 5, 1978. He’s 1.91 metres tall and plays lead guitar. Drummer Matt Flynn hails from Woodstock, New York. He’s 48 and was born on May 23, 1970. He’s 1.87 metres tall. PJ Morton is 1.77 metres tall and is the band’s keyboardist. He’s 38 and was born in New Orleans, Louisiana on March 29, 1981. Multi-instrumentalist Sam Farrar, 40, was born June 29, 1978. He’s from LA and stands at 1.88 metres tall. Why are Maroon 5 famous and what do they do? They are a pop-rock band and have had ongoing chart success since the 2002 release of their debut album Songs about Jane. They’ve released six albums to date and continue to tour around the world. The band support several charities and use their fame to highlight many good causes. 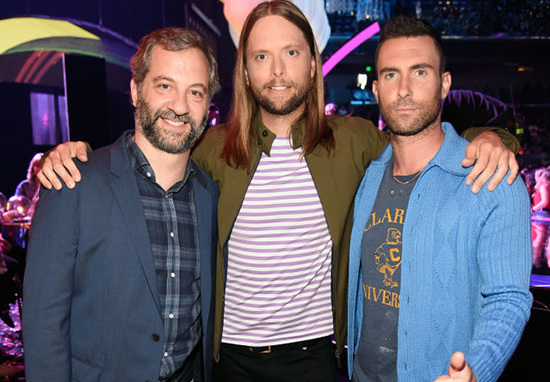 What are Maroon 5 net worth? Website The Richest estimated Maroon 5’s 2015 net worth as $45million. How much do Maroon 5 earn? The Richest also estimated Maroon 5’s 2015 earnings to be $33million. Who is the lead singer for Maroon 5, who is the drummer, what does Maroon 5 mean, where did they get their name? The band’s lead singer is Adam Levine. Matt Flynn is the drummer. The origin and meaning of the name Maroon 5 is shrouded in mystery, and the band like to keep it that way. Reportedly, the reason for the name isn’t very inspired, so the band thought it was better to retain the air of mystery around it. It’s speculated it’s related to the school Adam Levine and Jesse Carmichael attended, Five Towns College; one of the school’s colours is maroon. Who writes Maroon 5 songs? The band write most of their own material, although they collaborate with other artists from time to time. Have Maroon 5 broken up? They have not broken up, although members have taken occasional breaks. The line-up of the band changed after the original drummer, Ryan Dusick, left the band in 2006 due to injuries sustained from the constant drumming on tour. Is Maroon 5’s Sugar video real? The video for Sugar features the band ‘crashing’ various weddings, and is inspired by the 2005 movie The Wedding Crashers. Their appearance at each wedding was real and was a complete surprise to everyone except each groom; even then, the grooms did not know in advance which band would be appearing. What type of music do they produce, what was their first hit song? This Love and She Will Be Loved were the band’s first big hits, making the UK top ten in 2004. Their music type is described as pop-rock. What number one songs and albums have Maroon 5 released, when were they released? Their first two albums, Songs About Jane, released in 2002, and It Won’t Be Soon Before Long, released in 2007, both hit number one in the UK album chart. Their 2012 single Payphone with Wiz Khalifa is their only single to date to top the charts in the UK. What awards have Maroon 5 won? The group’s notable awards include three Grammy Awards for Best New Artist 2005, Best Pop Performance by Duo or Group with Vocal, for This Love in 2006, and the same award again in 2008 for Makes Me Wonder. They’ve also won numerous awards including Billboard Music Awards, American Music Awards and many others.